Nothing lasts forever, and in the 21st century, most people's employment is anything but guaranteed. What should have some permanence, however, is our digital footprint--the body of data that constitutes the true center of our professional lives. In this article, I'll explain how to protect the integrity of your most valuable business data as you make the transition from one job to another, or from job to jobless. As it happens, I recently quit my cushy full-time gig at a certain well-known tech publication. This is the seventh time I've made the leap in the past 15 years, and I'm getting pretty good at it. In that time, I've learned that it's not the office, the desk, the computer, the e-mail address, the business card, the title, or even the company that make you--in the professional sense--you. These things are just the props and backdrop on the current stage of your career, and they're likely to change frequently as your work life plays out. The things that make up your actual identity tend to be far more nebulous and ethereal: As a professional, your identity is much more closely linked to such intangibles as your contact list, your social media presence, the commitments you make via e-mail, and the esteem of your peers. For the most part, you build these things on your own. They're components of your personal brand--and as you move from job to job over the years, you'll want to take them with you. There are a number of ways to bundle up your digital life as you move through your career. Choosing the best approach depends largely on how you assess your current situation. If you're in no rush to leave your present gig, you'll likely get the most benefit from the "Always Be Leaving" section toward the end of this article. If you're preparing to give notice or if you sense that layoffs are headed your way, be sure to read the "Smooth Transition" section. And if you're minutes away from being escorted from the building by a couple of rent-a-cops, jump into the "Your Digital Life Raft" section, fast. If you walk past the water cooler and hear rumblings about layoffs coming down the hall, you may not have much time to lose. Many larger companies have been known to lock workers out of their PCs, freeze their e-mail accounts, and revoke their network access minutes before announcing layoffs, in an attempt to prevent data leaks. Rather than fretting about whether you're one of the unlucky ones about to be thrown overboard, just assume the worst and start preparing your digital life raft to carry you to shore. To get your life raft out of the building, you'll need some means of transport. The simplest solution is a USB keychain drive or SD Card, but a smartphone or cloud storage service can also work. Bear in mind, though, that moving a lot of large files to a cloud service can take a long time. Meanwhile, a keychain drive can look conspicuous and draw unwanted attention to what you're doing--even if you're on the up and up. A smartphone (if you own it and if no one objects when you carry it out of the building) makes an excellent choice. Think fast, size up your storage options, and act decisively. Create a folder on your desktop and name it "Life Raft" (or anything else, really; it doesn't matter). 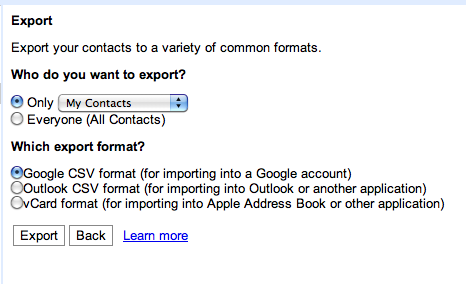 Export your contacts to a CSV file that you can import into any mail client or address book later. While you're in your e-mail client, pull up any important messages from recent projects that may hold promise for future work. What you should be looking for here are cues for business opportunities, not proprietary information that belongs to your company. For example, if you recently collaborated with an outside agency that may need your services going forward, you'll want to keep the relevant e-mail messages handy after you walk out the door. Open them up and forward them to your personal address. Alternatively, you can export the messages to your Life Raft folder and import them into your own mail client when you get home. Once you've collected everything you need from your hard drive (or from the server), copy that Life Raft folder onto your removable storage device, eject it, and slip it into your pocket. Now, while everyone else in the office is skittering around in a panic, you'll at least have the peace of mind of knowing that you're ready to walk out the door if the hammer falls on you. It's worth taking a moment here to point out the importance of respecting your company's intellectual property rights as you gather files to take with you. You arguably have a right to take your contacts and a few pieces of correspondence with you for reference, but you can get yourself into a heap of trouble by smuggling proprietary data out of the office. Steer clear of anything that might be construed as a company secret, such as product roadmaps or strategic marketing plans. Attempting to burn your recently former employer by trading on privileged information is a good way to undermine your professional credibility and torpedo your chances for making a quick and relatively painless rebound. It can also confront you with legal challenges that you're probably not prepared to withstand. Next Page: Prepare for a smooth transition.